Middle school teacher Tracy Tokunaga created a Nourish Class to give her students a direct experience of farm-to-table and healthy eating. I love the essential question “What’s the story of your food?” When we discovered the Nourish Curriculum, I created an elective class that serves about 150 seventh-grade students. We call it the Nourish Class. Our first year, we decided to take action in the community. We hosted a first annual Healthy Taste of Big Bear fundraising dinner. We invited local restaurants to donate healthy, local food. While we received some wonderful contributions, we learned that fresh, local ingredients can be hard to find. So, we took action again! This year, the Nourish Class collaborated with our Farm2Mountain Produce Club to enable seasonal, organic, locally grown food to be delivered to the classroom and the surrounding community. The Club is a weekly, farm-direct produce delivery service. Students are involved with taking orders, packing produce, and distribution of CSA boxes to the local community. On Tuesdays, the farmer delivers produce boxes to the school during the Nourish Class. Students then sort produce and attach packing slips. 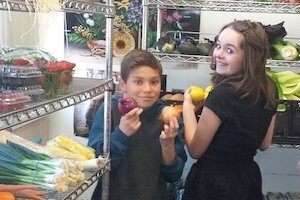 A group of students stays after school for the Produce Club and they run the show! Customers come to the classroom to pick up their orders, and the students manage the whole process. During this time, we use our juicer to share delicious juices. We also create a recipe for tasting. Crowd-pleasers include a roasted Brussels sprout dish and a cilantro-lime salad dressing over a fresh romaine salad. The Produce Club raises funds to support the Nourish Class with organic fruit and vegetable tastings, field trip opportunities, and cooking classes.